Land of corn is a documentary film about four environmental and land rights defenders from Mexico, Guatemala, Colombia and Honduras who work in an extremely dangerous environment and risk their lives, their freedom and the safety of their families because of the work they do. 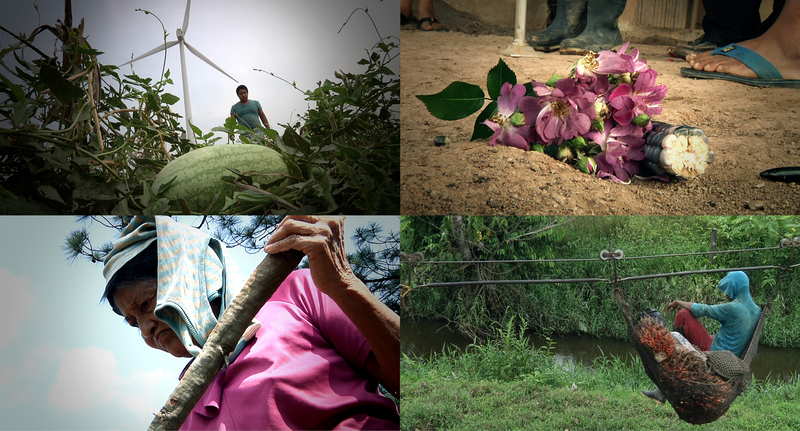 Sara Méndez travels every week to the Isthmus of Tehuantepec (Mexico), where some of the largest wind farms in the country are being constructed. Martín Gómez is resisting the construction of a hydroelectric project on the Chinacla River in Honduras. Mary Hernández had to seek refuge in the Curbaradó humanitarian zone because of threats she received while defending her land in a territory that has been subjected to large-scaled cattle ranching, palm oil tree cultivation and timber exploitation. Adrian Kal has been fighting for the past 15 years for his community´s land in Guatemala, which was sold to a logging firm. As Sara, Martin, Mary and Adrian explain their work and daily struggle, the audience learns about the threats they receive, their fears and the lack of protection mechanisms in their countries. What does PBI Colombia do? Peace Brigades International (PBI) has carried out observation and international accompaniment in thirteen countries on five continents since 1981 and in Colombia since 1994.